I vaguely remember my Mrs. buying me the pinballcats.co.uk address (or something like that) for a laugh last year when I kept showing her pictures of pinballs. And cats. Never did anything with it though. I have a cat allergy too. I was told that folk with cat allergies are not allergic to all cats. Someone I know with a lifelong cat allergy was encouraged to allow cats into the house by his children. The trick is to rub cats on your face to see whether you are allergic to that individual. If this prompts such a severe response that you die, your worries are over. By going to a few litters of kittens and doing this he was able to find two felines for his daughters that did not cause allergic reactions. Is he/she a good 'ratter'? Next you'll get to make some t shirts with pics of pinball cats on them alongside pithy ironic messages. Release a range of mugs/posters/key rings that say 'keep calm and the cat loves pinball'. You'll then get embroiled in a legal arguement over who owns the rights to who owns the 'cats love pinball' trademark. 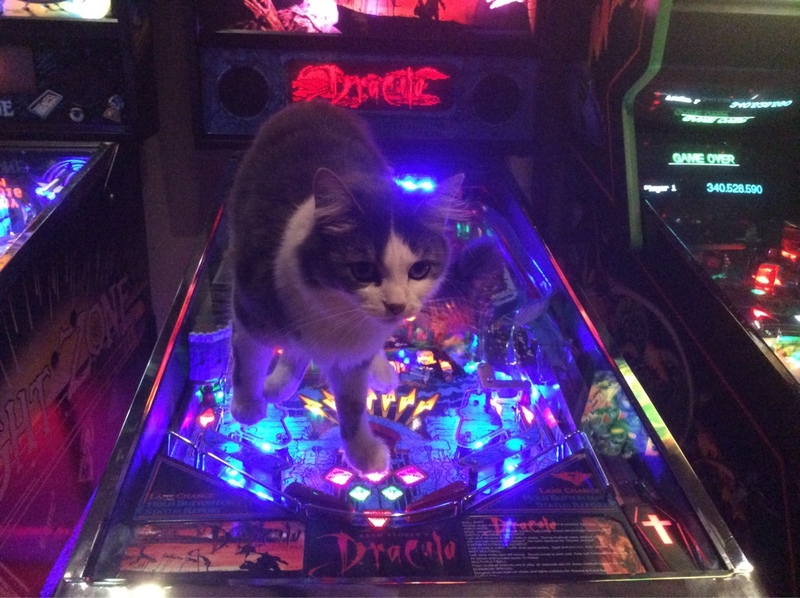 Finally you'll end up in a B list 'celebrity' reality show as the 'cats love pinball' man. Nice twist on being allergic to cats - the media will love it. Cat allergy you say ? That's not to be sniffed at. My and my mate were ****ed one night playing wh2o . A ball got stuck in the trough so we whipped the glass out,took the apron off and sorted it. poor ****er would have been in there all night had we fixed it right the first time! An open coin door is a magnet for curious cats. The transformer, wires leading from it and any power boards (old ss games) in the base of a pinball machine could kill them. Nice twist on being allergic to cats - the media will love it. Finally you'll end up in a B list 'celebrity' reality show as the 'cats love pinball' man. Tears of laughter, you ask? No, that's just the reaction. No way am I doing that - losing to Jedward would require a level of counselling that the NHS cannot afford. You sure it's looking for a flywire and not a fly? Ventured to the far corner of my workshop this morning....look what I found....a cheeky cat having a snooze!!.........a.k.a. "Peaches"
One of ours has decided that our pinball table is an excellent bed. Unfortunately, the first time she decided that, @SilverBall was in the middle of a four ball multiball! 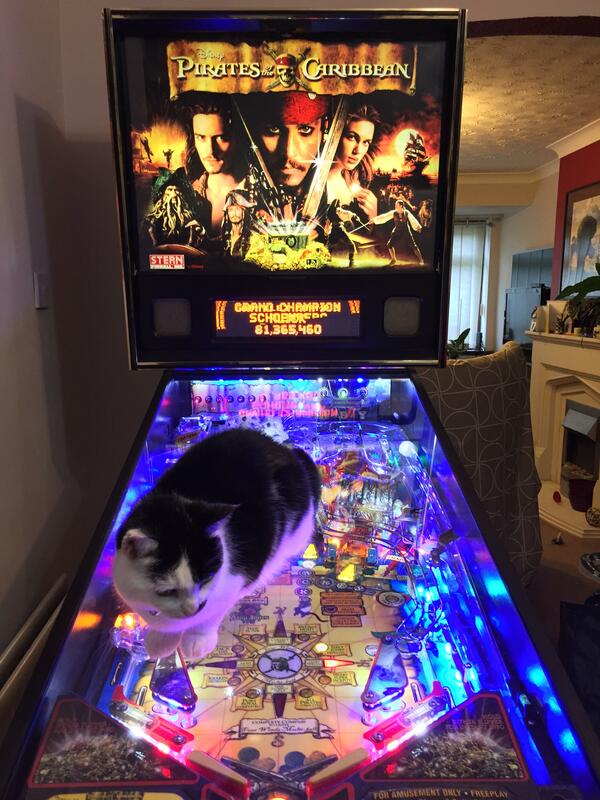 What the fook has been going on here ..
My cat is always too ****ed to worry about pinballs! Hi all cat lovers.....I just got a new workshop with very posh wall paper! It is also very warm...unlike my last workshop!